I love all Christmas songs, from the gorgeously melancholic "We Three Kings" to the wistfully optimistic "Have Yourself a Merry Christmas". Very few songs make me want to sing them out loud, but play a Christmas carol and I’ll start humming the words, whether I’m in a department store elevator or in a restaurant. And believe me, I have been getting a lot of Christmas music over here in Hong Kong – it is very nearly ubiquitous, from funky synthy versions in the shopping malls to unobtrusively classical piped-in versions in the posh casinos on Macau, to loungey languorous versions played by a jazz trio in a sumptuous hotel restaurant. The last version, of course, can be the worst kind of sentimental if you’re not in the mood, or the very loveliest sort of yuletide dreaminess, especially if the restaurant you’re sitting in is on the mezzanine of a hotel overlooking a ceiling-scraping Christmas tree limned in white and blue and silver, with equally ceiling-scraping windows on the other side overlooking the Hong Kong skyline glowing in rainbow of lights. A setting like this; a view like that; well, you’d have to be a grinch not to succumb to the tinkling of "The Christmas Song" in the background. So what better way to show my love for Christmas carols than through food? My last Christmas gift to you readers – a partridge in a pear tree, or a pear, at least. Alas that I didn’t have time to recreate the rest of the twelve days of Christmas, but, well, it’s the partridge that everyone always remembers, right? The recipe is adapted from Kate Zuckerman’s take on the classic linzer cookie in The Sweet Life , and it’s a keeper: light, crisp, richly redolent of hazelnuts and just barely warmed with a hint of cardamom and cinnamon. 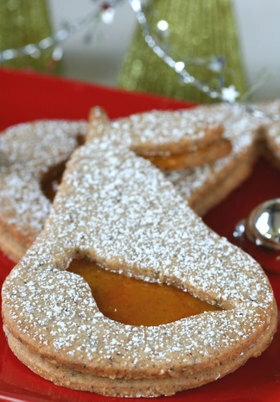 I find many linzer cookies overly sweet, especially with the added powdered sugar; this version has a more restrained, adult flavor that sets off a filling of raspberry or apricot jam perfectly. Although I prefer raspberry jam for the dramatic coloring it provides, it seemed apricot jam was more appropriate here since I was going for a pear shape. If you have a pear jam, by all means try it as well. This cookie tastes wonderful regardless of what form it takes or what filling it contains, but if you do go for the partridge-and-pear shape, I hope you and your guests enjoy this most elegant of visual puns. I have to say the cookies still make me smile and sing the refrain to the song in my head every time I see them. Well, I’m ready to finish counting down the days to Christmas…I hope all of you are enjoying your holiday baking! You’ll probably hear from me again after I’ve returned back to the states at the end of December, so I’d like to wish all of you and your loved ones a very happy holidays, and best wishes for a sweet new year! P.S. The hotel with the jazz trio would be the Grand Hyatt Hong Kong, that bastion of refined luxury. Last night I had the pleasure of listening to them play while indulging in the Tiffin Room’s famous Dessert Buffet, a spread composed almost entirely of sweets, from petit fours to grand gateaux to ice cream to chocolates to souffles to confections. How could this pastrygirl not recommend a place where you can have dessert first, last, and all places in between? P.P.S. Menu for Hope has been extended through the weekend – so you have a last chance to get in your bids for the prize of your choice! My prize has been tipped as a long shot – thank you so much for all your support! You still have a chance to win it or any of the other wonderful prizes, so take a last look! Place the hazelnuts and about half of the flour in a food processor. Process until the nuts are ground into a fine powder. Combine the rest of the flour, the salt, cinnamon, cardamom, and baking powder in a bowl. Pour the ground nut mixture into the bowl and whisk together to combine. Put the butter in the bowl of a stand mixer and beat on medium speed for about a minute. Add in the sugar and beat for several minutes until the mixture is very light colored and fluffy. Add in the egg and beat until combined, about 2 minutes. Scrape down the sides as necessary. Add in the flour mixture and beat on low speed until combined. Scrape down the sides as necessary. Continue beating for a couple minutes until the dough starts coming together into a ball. Scrape out the dough onto a clean surface. Flatten the dough out into a rough rectangle about an inch thick, wrap in plastic, and chill in the refrigerator for at least 2 hours. You can store this dough in the refrigerator for up to 3 days. When you are ready to bake the cookies, preheat the oven to 350 degrees F. Line baking sheets with parchment or Silpats. Take the dough out of the refrigerator and let it sit for about 10 minutes to soften a bit. Do not let it get too soft, though, or it will become too sticky to work with. Roll the dough out to about 1/16" thick. Use desired cutters to cut out shapes from the dough. Place the shapes on the baking sheets. You can reroll the scraps and cut out more shapes. Chill the dough if it becomes too soft to work with. Chill the baking sheets for about 10 minutes in the refrigerator before baking. Bake cookies in the oven for about 10-14 minutes, depending on the size of the cookies. Rotate the cookies halfway through baking. The cookies should turn darker golden but should not become dark brown, and should smell like toasted hazelnuts. Let the cookies cool on wire racks before removing from the sheets. When you are ready to serve the cookies, spread half of the cookies with the apricot jam, and place the other cookies on top to make sandwiches. Sift confectioner’s sugar over the sandwiches (if you are making cutout cookies, sift the sugar over the top cookies before you make the sandwiches). Because the jam will soften the cookies, assemble them shortly before you will serve them. I do like visual puns in food, and this one is so elegant and sweet! I love this, and I’m totally jealous of your Hong Kong experience. Merry Christmas! These cookies look so yummy! I’m looking forward to more of your beautiful posts in the new year. Hope you’re enjoying yourself in HK…I can’t wait to go back myself. I’ll definitely have to check out the dessert buffet! I saw those and soooo want the cookie cutter now. It looks so wonderful. Have a great Christmas Anita. Merry Christmas Anita and may 2008 be a delicious year for you! Absolutely gorgeous cookies. Thanks for the creative inspiration and a grand New Year to you! Such a lovely cookies…..such a jewel! Merry Christmas & Happy New Year! That is the prettiest cookie I’ve seen all year (including the magazines). So beautiful and classic and makes me smile! Have a sweet holiday! What a great creative cookie idea! Have a wonderful time on your trip! Happy Holidays! What a coincidence. 🙂 I just finished making the dough for these same cookies. I’m letting them chill overnight so I haven’t been able to taste them yet. Glad to hear that you like her recipe. Her book is quickly becoming a fave of mine. Happy Holidays Anita! What beautiful cookies! I hope you have a wonderful holiday! Thanks for all your wonderful blog entries. You are amazing! wow, those are indeed gorgeous-looking cookies. merry christmas and a happy new year, anita. i can’t wait to see what other awesome treats u’ll be making in the following year. merry xmas Anita, i do love listening to xmas music too, the older the better. 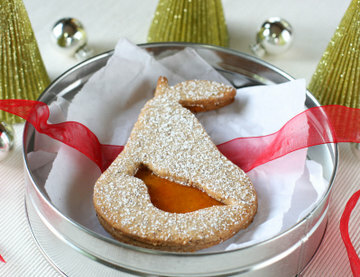 love the pear & partridge cookies, i’ve seen it in a book somewhere too, very cute! The cookies look and sound wonderful, Anita! Happy holidays, sweetie and all the best for 2008! Great looking cookies, I haven’t tried these yet…but it’s hard to go wrong with Kate’s recipes. Happy Holidays! those are really a work of art! I don’t know if I’d be able to put one in my mouth! Wow!! What a cute take on a classic cookie. These look delicious and so Christmas-y! Happy holidays! Happy Holidays and all the best to you in the coming new year. dearest anita, what utterly beautiful linzer cookies! and a visual pun to boot 😉 merry christmas and a happy new year to you! u should check out this restaurant called tribute in soho if u have the time.. they have really good food..
wow, that’s one good-looking tree:) hope you had a great X’mas, and wish you a very Happy New Year! Anita, these are truly beautiful! What an inspired idea! I love thumb print and linzer cookies, but the visual pun makes it all the sweeter! Thank you all for your wonderful comments and I hope you had a wonderful holidays! I love that cookie because I have a collection of partridge in a pear tree Christmas ornaments and would love to bake these cookies at Christmas. But, where can I purchase the cookie cutters to make the pear and the partardige cut out inside the pear? Thanks for the recipe. I got my cutter from kitchengifts.com. It was a lucky find! Your collection of ornaments sounds wonderful! These cookies are gorgeous and the addition of cardamom sounds awesome!